If you like spicy food, this is going to be your new favorite – Spicy Bombay Potatoes or Masala Aloo. Baby Potatoes cooked with aromatic spices, as a one-pot dish, are perfect to serve as an appetizer or a side dish. These delicious and easy Bombay Potatoes take just 20 minutes to make in the Instant Pot or on stovetop. I am usually not a big fan of potatoes. However…with this masala aloo, I could not resist myself and kept eating them. I made about four servings, but clearly ate up two of them myself. It is so easy to keep popping them in your mouth, and they are so yummy with the sprinkle of lime juice, it is hard to stop eating! 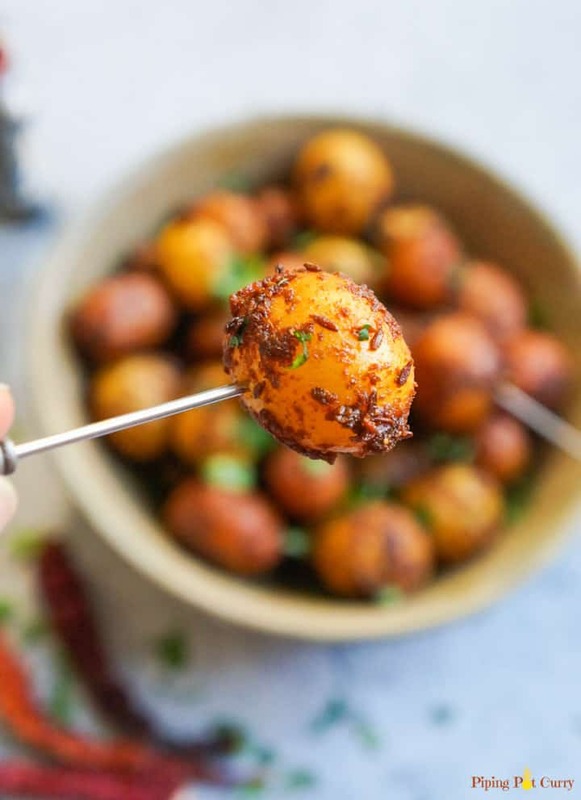 If you don’t like spicy, then I am definitely going to give some options to reduce the spice and still enjoy these amazing baby potatoes made in the instant pot. 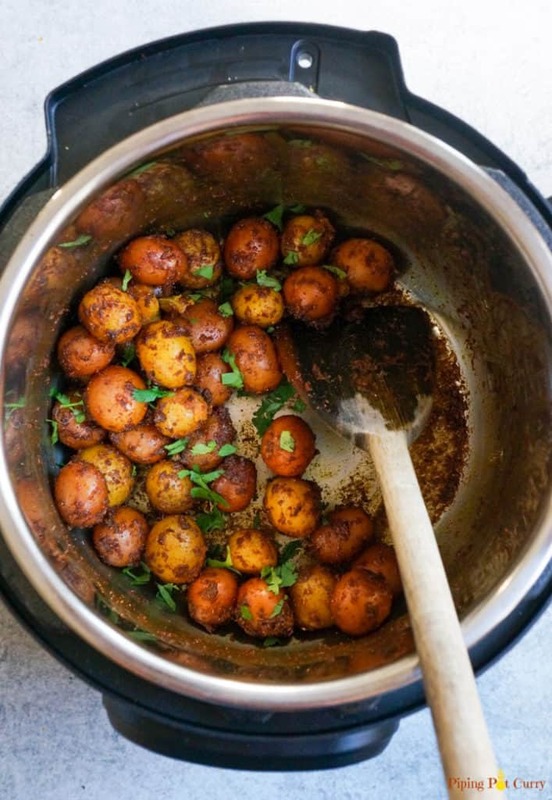 To just steam baby potatoes, check out the post for Instant Pot Steamed Baby Potatoes. If you like potatoes, do check out these Garlic Chili Potatoes or the popular Aloo Gobi or this Potato Curry in Tomato Gravy (Aloo Rasedar). 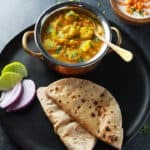 A recent potato curry favorite for us has been Potato Curry in Yogurt Sauce (Dahi Aloo) which has such a unique taste and takes just 15 minutes to make! Bombay potatoes, also called Bombay aloo is an Indian dry dish prepared using boiled cubed potatoes, flavored with various spices such as cumin, coriander, garam masala, turmeric, chili powder, salt and raw mango powder. Traditionally potatoes are first boiled, peeled and then sautéed in spices. However with my love for one-pot dishes, I have simplified this recipe to make in a single pot or in an instant pot. 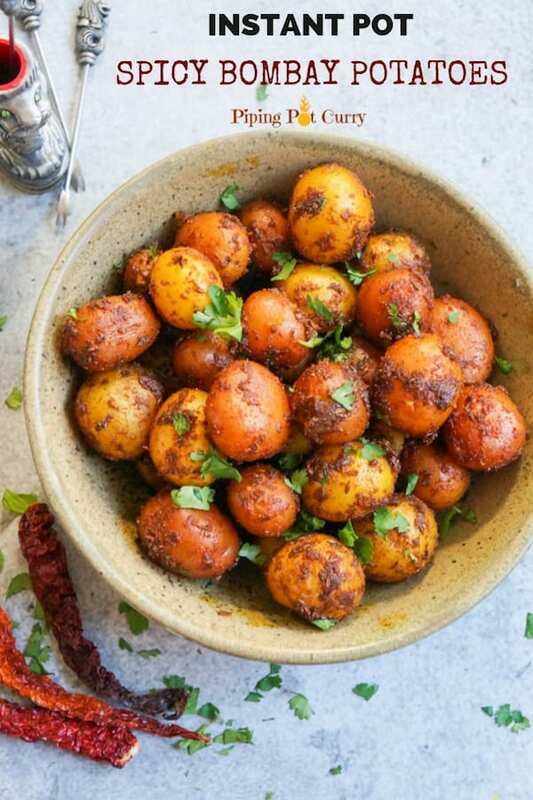 These Spicy Bombay Potatoes can double up as an appetizer or as a side dish. Add toothpicks to serve it as an appetizer for a party. 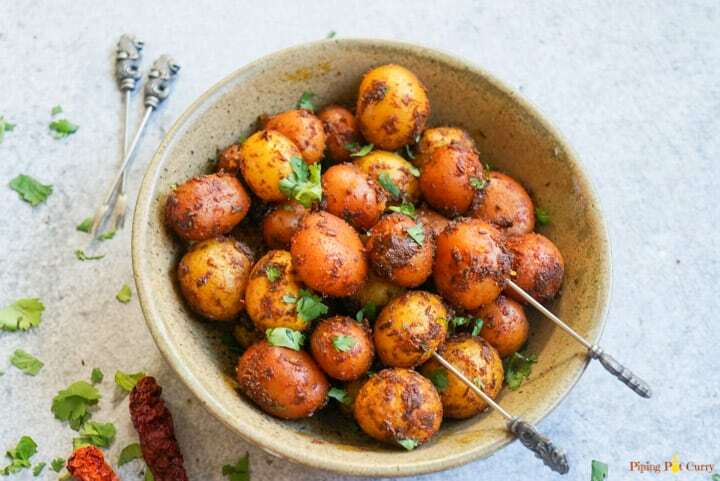 Or serve these spicy baby potatoes as a side with lentils and rice. How to make Bombay Potatoes? 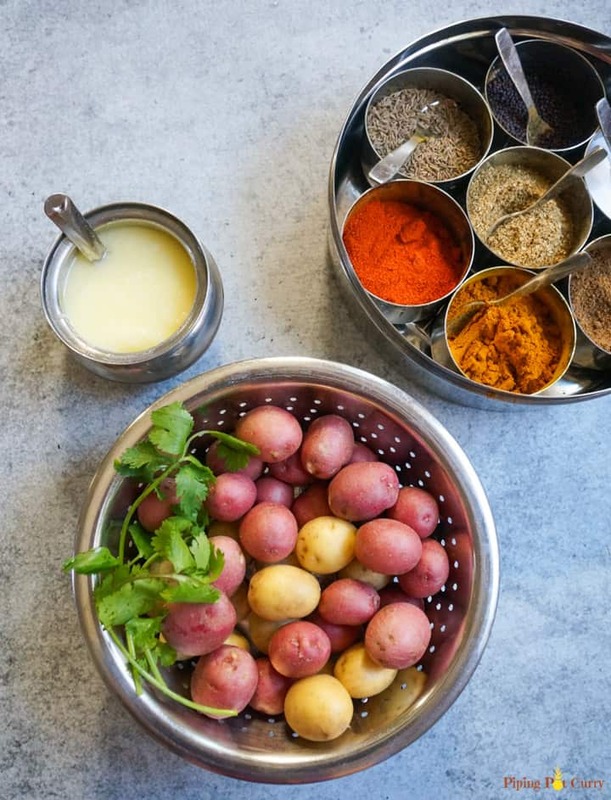 Let’s start with gathering the ingredients, which are just a few for these Bombay Potatoes. You need baby potatoes, spices, ghee/oil and some cilantro. 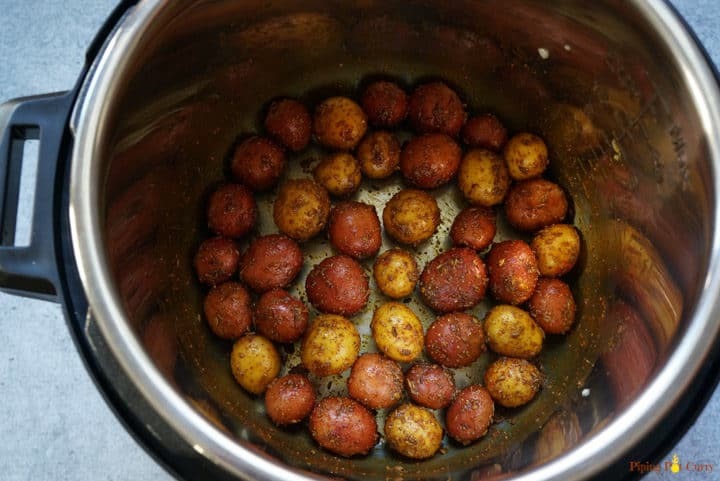 When making Bombay Potatoes on the stovetop, first boil the baby potatoes. You want them to be just tender, do not overcook. Then in a pan, heat oil and add cumin seeds. Reduce heat and add the spices. Sauté them for 30 seconds, be careful to not burn them. Add 2-3 tablespoons of water and the potatoes. Mix well so the spices coat over the potatoes. Cover and cook for 5 minutes. The water will evaporate and the spices will coat the potatoes. Add dry mango powder (amchur), cilantro and lime juice. Bombay potatoes are ready to be served. 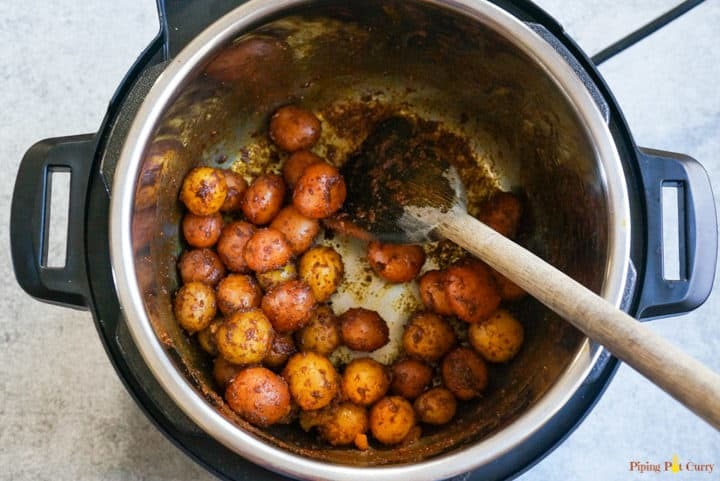 How to make Bombay Potatoes in Instant Pot? To make these in the instant pot, we will make it as a one-pot recipe. Use raw baby potatoes, wash them well. Start the instant pot in sauté mode and heat ghee/oil in it. Add the baby potatoes and salt. Sauté for about 3 minutes to crisp them on the sides. This is optional, but you will love it. Now add the spices and water (you can also use broth). Mix well and pressure cook for 4 minutes at high pressure. Then do a 10 minute NPR, which means release the pressure after 10 minutes of the beep. The image on the left above is before pressure cooking and the right is after pressure cooking. You can see that the potatoes hold their shape well even after pressure cooking. When you open the instant pot, there will be some liquid left. Change back to Saute mode and the water will dry up in just 2 minutes and the spices will perfectly coat the potatoes. Add the dry mango powder, garam masala, cilantro and serve topped with lime juice. They are sooo good! 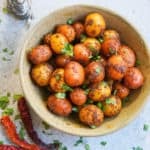 What to serve with Bombay Potatoes? 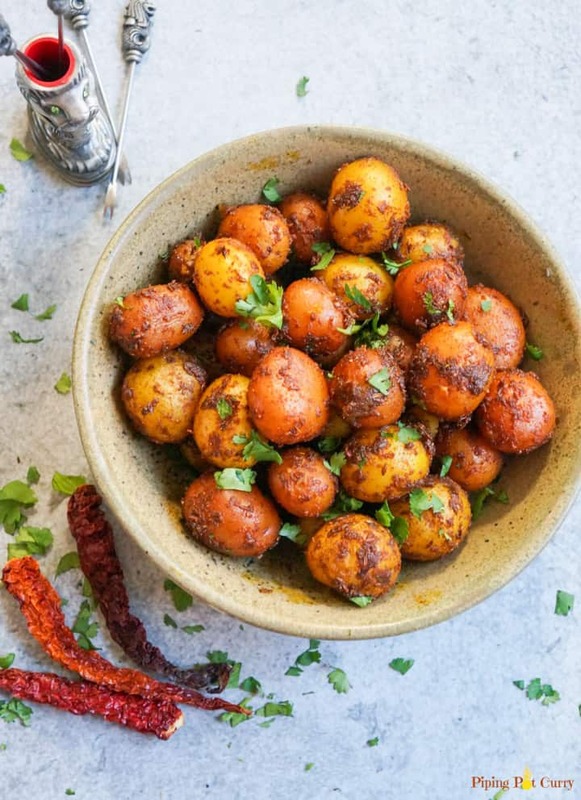 These Spicy Baby Potatoes will pair perfectly with something which is mildly spiced. I like to serve these Bombay Potatoes as a side along with a protein such as chicken curry, baked chicken or a lentil soup (dal). 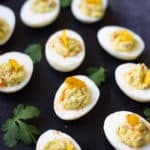 Don’t forget they are also a great appetizer for a party! √ Saute them before pressure cooking, so they brown on the sides. This is optional, but recommended. √ Add the water after just sautéing the spices for a few seconds, else they can burn. √ Do not overcook the potatoes, otherwise they will break. Although baby potatoes can stay intact with up to 8-10 mins of pressure cooking. √ I prefer to not peel the potatoes and get the nutrients in the skin. However you can choose to peel them. √ Lime juice is a must, especially when serving as an appetizer. It adds a wonderful tanginess to the potatoes. 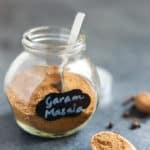 √ If you like less spice, then reduce/skip the red chili powder and add the garam masala at the end to taste. Baby Potatoes cooked with aromatic spices, as a one-pot dish, are perfect to serve as an appetizer or a side dish. These delicious and easy Bombay Potatoes take just 20 minutes to make in the Instant Pot or on stovetop. Start the instant pot in Saute mode and heat ghee/oil in it. Add cumin seeds. Add potatoes and salt. Saute for 3-4 mins so they slightly brown on the sides. Press Cancel and close lid with vent in sealing position. Change the instant pot setting to manual or pressure cook mode at high pressure for for 4 mins. Garnish with chopped cilantro and sprinkle lime juice while serving. Boil the potatoes in water until almost tender. You want them to be just tender, do not overcook. Drain and put aside. In a pan, heat ghee/oil and add cumin seeds. Reduce heat and add the spices. Sauté for 30 seconds, be careful to not burn them. Add water and boiled potatoes. Mix well so the spices coat over the potatoes. Cover and cook for 5 minutes. The water will evaporate and the spices will coat the potatoes. Add dry mango powder (amchur), garam masala, cilantro and lime juice just before serving. Replacement for Dry Mango powder: This basically adds some tanginess to the potatoes. You can replace with more lime juice. Peeling Potatoes: I prefer to not peel the potatoes and get the nutrients in the skin. However you can choose to peel them. Too spicy? If you like less spice, then reduce/skip the red chili powder and add the garam masala at the end to taste. 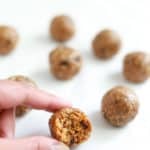 Vegan Variation: Skip ghee and use your favorite vegetable oil to make this vegan. I have an extremely talented stunning wife and lovely grown up children. We love these baby potatoes and cook it up every month. We almost use the same recipes featured but with one difference – – – we never use the steel spikes, they can be dangerous. We use wooden ones that we serve with chicken or fish tikkas. Hi Yusuf – Glad to hear you enjoy the Bombay potatoes! Hello Banita – The steel insert is the steel pot that came with the ip. You want to always use that steel insert for any recipe you make in the ip. Hope that helps! 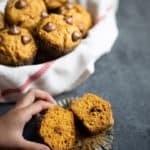 Thank you for this yummy and super easy recipe. I made it this morning and it turned our DELICIOUS!!! Yay! So happy to hear you enjoyed the Bombay Potatoes. Thank you for sharing back your review! Hey Krina – So happy to hear you enjoyed the potatoes. They are perfect for entertaining. Thank you for sharing back your review! Looks great, I wanted to make it today. If I make it in the morning and want to serve in the evening, should I just microwave it, add the amchur/lime before serving? Thanks for trying Mythili. You can add them right after cooking. Add cilantro and more lime juice to taste when serving. Hope you enjoy it! meeta when are u adding the garam masala with the spices? Hey Ritika – Sorry for the confusion. I clarified on the recipe now. I add the garam masala along with the amchur at the end, so it is also easy to adjust it to taste. Hope you enjoy them! Thanks this recipe looks and sounds delicious. Can’t wait to try. Hey Anisha – Glad that you enjoyed the potatoes. The key is to just saute for 1-2 minutes at the end, which heats the ip enough to dry the leftover water. I will make this more clear in the recipe. Thank you for sharing back your review and the issue you faced.